Why are we morally obligated to fight climate change? Climate change is a crisis, and crises alter morality. Climate change is on track to cause the extinction of half the species on earth and, through a combination of droughts, famines, displaced people, and failed states and pandemics, the collapse of civilization within this century. If this horrific destructive force is to be abated, it will be due to the efforts of people who are currently alive. The future of humanity falls to us. This is an unprecedented moral responsibility, and we are by and large failing to meet it. Crises alter morality; they alter what is demanded of us if we want to be considered good, honorable people. For example—having a picnic in the park is morally neutral. But if, during your picnic, you witness a group of children drowning and you continue eating and chatting, passively ignoring the crisis, you have become monstrous. A stark, historical example of crisis morality is the Holocaust—history judges those who remained passive during that fateful time. Simply being a private citizen (a “Good German”) is not considered honorable or morally acceptable in retrospect. Passivity, in a time of crisis, is complicity. It is a moral failure. Crises demand that we actively engage; that we rise to the challenge; that we do our best. What is the nature of our moral obligation to fight climate change? Our first moral obligation is to assess how we can most effectively help. While climate change is more frequently being recognized as a moral issue—the question, “How can a person most effectively engage in fighting climate change?” is rarely seriously considered or discussed. In times of crises, we can easily become overwhelmed with fear and act impetuously to discharge those feelings to “do something.” We may default to popular or well-known activism tactics, such as writing letters to our congress people or protesting fossil-fuel infrastructure projects without rigorously assessing if this is the best use of our time and talents. The question of “how can I best help” is particularly difficult for people to contemplate because climate change requires collective emergency action, and we live in a very individualistic culture. It can be difficult for an individual to imagine themselves as helping to create a social and political movement; helping the group make a shift in perspective and action. Instead of viewing themselves as possibly influencing the group, many people focus entirely on themselves, attempting to reduce their personal carbon footprint. This offers a sense of control and moral achievement, but it is illusory; it does not contribute (at least not with maximal efficacy) to creating the collective response necessary. We need to mobilize, together. Climate change is a crisis, and it requires a crisis response. A wide variety of scientists, scholars, and activists agree: the only response that can save civilization is an all-out, whole-society mobilization. 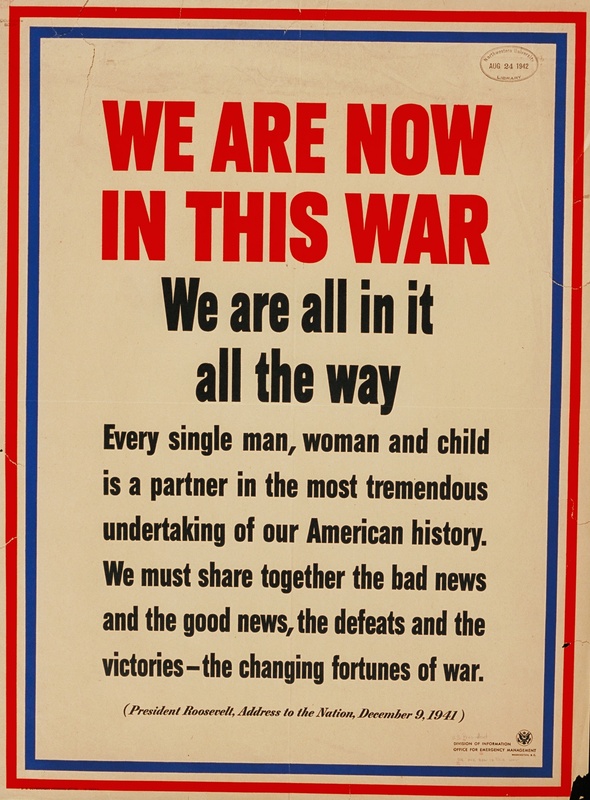 [i] World War II provides an example of how the United States accomplished this in the past. We converted our industry from consumer-based to mission-based in a matter of months; oriented national and university research toward the mission, and mobilized the American citizenry toward the war effort in a wide variety of ways. Major demographic shifts were made to facilitate the mission, which was regarded as America’s sine qua non; for example, 10% of Americans moved to work in a “war job,” women worked in factories for the first time, and racial integration took steps forward. Likewise, we must give the climate effort everything we have, for if we lose, we may lose everything. Where we are. While the need for a whole society and economy mobilization to fight climate change is broadly understood by experts, we are not close to achieving it as a society. Climate change ranks at the bottom of issues that citizens are concerned about[ii]. The climate crisis is rarely discussed in social or professional situations. This climate silence is mirrored in the media and political realm: for example, climate change wasn’t even mentioned in the 2012 presidential debates. When climate change is discussed, it is either discussed as a “controversy” or a “problem” rather than the existential emergency that it actually is. Our civilization, planet, and each of us individually are in an acute crisis, but we are so mired in individual and collective denial and distortion that we fail to see it clearly. The house is on fire, but we are still asleep, and our opportunity for being able to save ourselves is quickly going up in smoke. Understanding the gap: The role of pluralistic ignorance. How can this be? How are we missing the crisis that will determine the future of our civilization and species? Dr. Robert Calidini, social psychologist and author of Influence, describes the phenomena of “pluralistic ignorance,” which offers tremendous insight into this question—and into how we can beat the trance of denial and passivity. In the following passage, Dr. Calidini is not discussing climate change, but rather, the phenomena of emergencies (heart attacks, physical assaults, etc.) that are sometimes witnessed—and ignored— by dozens of people, especially in urban settings. These tragic instances are often ascribed to “apathy”—the hardening of city dwellers’ hearts toward each other. But scientific research shows something very different. Research shows that if one person witnesses an emergency, they will help in nearly 100% of instances. It is only in crowds—and in situations of uncertainty—that we have the capacity, even the tendency, to ignore an emergency. Very often an emergency is not obviously an emergency. Is the man lying in the alley a heart-attack victim or a drunk sleeping one off? Are the sharp sounds from the street gunshots or truck backfires? Is the commotion next door an assault requiring the police or an especially loud marital spat where intervention would be inappropriate and unwelcome? What is going on? In times of such uncertainty, the natural tendency is to look around at the actions of others for clues. We can learn, from the way the other witnesses are reacting, whether the event is or is not an emergency. What is easy to forget, though, is that everybody else observing the event is likely to be looking for social evidence, too. And because we all prefer to appear poised and unflustered among others, we are likely to search for that evidence placidly, with brief, camouflaged glances at those around us. Therefore everyone is likely to see everyone else looking unruffled and failing to act. As a result, and by the principle of social proof, the event will be roundly interpreted as a nonemergency. These paragraphs vividly illustrate how denial of the climate crisis is cocreated through the effect of pluralistic ignorance. We look around us and see people living their lives as normal. Our friends, coworkers, and family members are all going about their days as they always have. They are planning for the future. They are calm. They are not discussing climate change. So surely there is no emergency. Surely civilization is not in danger. Calm down, we tell ourselves, I must be the only one who is afraid. This situation creates an intense amount of social pressure to act calm and not appear hysterical or “crazy.” We all want to fit in, to be well liked and to be considered “normal.” As of today, that means remaining silent on the effects of climate change, or responding with minimization, cynicism, or humor. It is taboo to discuss it as the crisis it is, a crisis that threatens all of us, and that we each have a moral obligation to respond to. Of course, this pluralistic ignorance of the climate emergency is reinforced and bolstered through misinformation campaigns funded by fossil-fuel companies and the hostility of the few. “Better not bring up the climate crisis,” we tell ourselves, “It’s a controversial topic. Someone might really lose their temper.” However, the responsibility for pluralistic ignorance is widely shared. The vast majority of us—including those of us who believe in climate science and are terrified by climate change—are still, unwittingly, contributing to pluralistic ignorance. How can we meet our moral obligation, and effectively fight climate change? Groups of bystanders fail to help because the bystanders are unsure rather than unkind. They don’t help because they are unsure of whether an emergency actually exists and whether they are responsible for taking action. When they are sure of their responsibilities for intervening in a clear emergency, people are exceedingly responsive! Dr. Calidini provides a vivid example of how to apply this knowledge to a personal emergency—if you begin experiencing the symptoms of a stroke in a public place. As you start to feel ill, you slump against a tree, but no one approaches you to help. If people are worried about you, they look around, see everyone else acting calm, and decide that there is no emergency and no need to intervene. People are taking cues from each other to deny and ignore your crisis. How can you call forth the emergency intervention you need? Stare, speak, and point directly at one person and no one else: “You, sir, in the blue jacket, I need help. Call an ambulance.” With that one utterance you should dispel all the uncertainties that might prevent or delay help. With that one statement you will have put the man in the blue jacket in the role of “rescuer.” He should now understand that emergency aid is needed; he should understand that he, not someone else, is responsible for providing the aid; and, finally, he should understand exactly how to provide it. All the scientific evidence indicates that the result should be quick, effective assistance. Humans contain a great capacity to help each other, to dutifully respond to the needs of others, and to improve the world around us. We also have a need to feel good about ourselves, and that includes fulfilling our moral obligations. When it is clear there is an emergency, and we have a vital role in responding to it, we respond vigorously. Climate change is a crisis, and it is your responsibility. Effectively intervening in pluralistic ignorance should be considered the primary goal of the climate movement. Climate change is a crisis that demands a massive collective response. This truth will become crystal clear if we overcome the forces of denial and pluralistic ignorance. To call forth an emergency response from people, we have to put them in the role of rescuer. We must make clear that (1) an emergency is unfolding and (2) YOU have a critical role in responding to it. Breaking from standard climate communications. Avoiding or finessing the frightening truths of climate change is not only ethically dubious, it is also bound for failure. If we want people to respond appropriately to the climate crisis, we have to level with them, and if we want to claim the moral high ground, we cannot distort the truth just because it’s easier. A major reason that climate communications have been so milquetoast is that they have lacked a large-scale social movement and political strategy that individuals can be a meaningful part of. Instead, individuals have been addressed as “consumers” who should strive to minimize their individual carbon footprint or environmental impact. This approach is nonsocial and nonpolitical and casts individuals as perpetrators who should attempt to reduce the amount of harm they are causing, rather than rescuers who can make a meaningful contribution to a collective solution. This point deserves emphasis, as it is so often misunderstood in our intensely individualistic culture. Our moral obligation to fight climate change is to build a collective solution, not to purify ourselves as individual consumers. This common response to the climate crisis can even be counterproductive in several ways: (1) it keeps the burden of responding to climate change on the individual, implicitly rejecting the idea of a collective response; (2) it perpetuates the message that there is no crisis by demanding only slight modifications to “business as usual”; and (3) it is often perceived as “holier than thou,” which can create the perception of barriers to entry to the movement. For example, a person might be deeply concerned about the climate crisis but feel they lack “standing” to voice their feelings because they eat meat or fly to Europe. We must create an atmosphere in which active engagement in the climate crisis is considered a fundamental part of living a moral life. To accomplish this, we have to give people opportunities to be a meaningful part of the solution; we have to give them the opportunity to be rescuers. The Pledge to Mobilize: A tool that creates rescuers. I have worked for the past 18 months with The Climate Mobilization—a growing network of teammates, allies, and consultants to develop a tool intended to help individuals intervene in collective denial and pluralistic ignorance and call forth the all-out emergency response needed to protect civilization and the natural world. The Pledge provides a bridge between individual and collective action—the actions that Pledgers agree to are all social and political in nature: things that one person can do to influence the group. Most important is personal commitment: #3— to spread the truth of climate change, and the Pledge itself. This is a strategy to reverse pluralistic ignorance and social pressure, which is supported by psychological research. [iv] People who take the Pledge start conversations with their friends and family about the climate crisis that include realistic solutions. This means that talking about climate change doesn’t mean just bearing bad news—but also showing the way forward—helping to channel the panic and despair that climate truth can evoke. On December 7, 1941, the United States experienced a sudden, collective exit from pluralistic ignorance. Before Pearl Harbor, the country was mired in the denial of isolationism. “The war doesn’t concern us,” we told ourselves. “Lets stay out of it.” With one devastating surprise attack, that pluralistic ignorance transformed into a culture of mobilization, in which every citizen had a role to play in supporting the war effort—every American became a rescuer—a critical part of a shared mission. Many scientists and scholars who recognize the need for a World War II–scale climate mobilization believe that some catastrophic event—a super-storm, a drought, or an economic collapse, will similarly jolt us out of our collective climate denial. There is reason to doubt this, however, given how much more complicated climate change is than a surprise attack. Further, we have a moral obligation to achieve this collective awakening as soon as possible. Talking about the climate crisis candidly and our moral obligation to stand against it— whether using the Pledge to Mobilize, or not—helps prepare people to see the crisis. Conversations that seem unsuccessful may alter how the person processes climate-related disasters in the future, or make them more likely to seek out or absorb information about the crisis. Give it a try. Talk with five people about the climate crisis this week. Talk about how afraid you are, and how you feel it is a moral obligation to spread the fact that we are in a crisis. Consider taking the Pledge to Mobilize—it will provide you with a tool to help you intervene in pluralistic ignorance, as well as a community of individuals who are committed to this approach. It takes courage to face climate change honestly, and discussing it with other people puts you at risk of rejection and hostility. But morality demands we do what is right, not what is easy. We must rise to the challenge of our time, together. [i] Selected advocates of a WWII scale climate mobilization: Lester Brown, 2004; David Spratt and Phillip Sutton, 2008; James Hansen, 2008; Mark Deluchi and Mark Jacobsen, 2008; Paul Gilding, 2011; Joeseph Romm, 2012; Michael Hoexter, 2013; Mark Bittman, 2014. [ii] Rifkin, 2014. “Climate Change Not a Top Worry in US.” Gallup Politics. [iii] For example, “Connecting on Climate” created by Columbia University and EcoAmerica which is widely considered an authoritative applied synthesis of the psychological work on climate. This 30-page document does not contain the words “crisis,” “emergency” or “collapse.” It encourages communicators to emphasize the benefits of solutions, rather than the severity of the problem. It also emphasizes behavior changes that individuals can make in their own homes and lives, rather than explicitly political solutions. [v] For a fuller description of The Climate Mobilization’s strategy, read our strategy document, Rising to the Challenge of Our Time, Together. Living in Climate Truth is, I believe, the most widely read article I have written. Originally published on Alternet, it was viewed more than 10,000 times and received more than 1,400 shares on Facebook, and was featured on EcoBuddhism. It continues to be one of the most read articles on this blog. When I originally published this article, in September, 2013, I advised readers to “live in climate truth, politically” by taking part in organizations that are honest about the scope of the climate threat, and possessed a comprehensive plan for victory (as opposed to pursuing piecemeal reform). However, I had to admit that I did not know of any organizations that fulfilled those precepts and encouraged readers to change the culture of existing groups or create new ones. Since then, I have followed my own advice, working with a group of individuals, to launch The Climate Mobilization. We are truthful about the acute danger posed by climate change and comprehensive in our advocacy– demanding a WWII scale mobilization that reduces emissions at wartime speed. Our strategy is the Pledge to Mobilize. Signers commit to both supporting political candidates who endorse these measures, and to spreading the truth of climate change, and the hope of the Pledge to Mobilize, to others. The Climate Mobilization is my attempt to translate the principles expressed in this paper into concrete action that any individual can take. 6 weeks after launching, it has been signed by over 100 people, and is growing everyday. I hope you join us. The lie says we are fine—that climate change isn’t real, or is uncertain, or is far away, or won’t be bad enough to threaten humanity. The lie says that small changes will solve the problem. That recycling, bicycling, or closing the Keystone Pipeline will solve the problem. The lie allows people to put climate change in the back of their minds. To view it as someone else’s issue—the domain of scientists or activists. The lie allows us to focus on other things. To proceed with business as usual. To be calm and complacent while our planet burns. Planet Earth, creation, the world in which civilization developed, the world with climate patterns that we know and stable shorelines, is in imminent peril. The urgency of the situation crystallized only in the past few years… The startling conclusion is that continued exploitation of all fossil fuels on Earth threatens not only the other millions of species on the planet, but also the survival of humanity itself—and the timetable is shorter than we thought. I wish to emphasize two issues that are often misunderstood. First: the time line. Many refer to climate change as a problem for our grandchildren—as occurring sometime in the future. But climate change is happening right now. Storms are becoming more extreme. Droughts are damaging crop yields, and contributing to civil wars, especially in Africa and in the Middle East. Fish and birds are migrating north. Humans are starting to follow. These problems will get worse and worse. They will combine with each other to create large-scale disruptions, disruptions that could overwhelm us, causing the breakdown of the social order and the rule of law. These catastrophic scenarios are decades, not centuries, away. The other issue is uncertainty and how we should incorporate it into our thinking and plans. Our climate and ecosystems are dynamic, non-linear systems. It is therefore hard to predict precisely what will happen and when as the Earth’s climate changes. Scientists don’t have a test case from which to derive predictions. We are the test case. Shall we make “Scientists don’t know everything! They aren’t sure!” our anthem and take this uncertainty as license to continue business as usual? No. Actually, the opposite. We know that carbon and greenhouse gasses will cause catastrophic impacts for humanity, but we don’t precisely how and when—they will unfold. This uncertainty must therefore reinforce our urgency to make major, systemic changes as rapidly as possible. By delaying action, we are playing round after round of Russian Roulette. Instead of recognizing the gruesome danger and inevitable outcome, we comfort ourselves with the fact that the bullet might not be in the chamber this time. The lie says that there is no crisis. That business as usual is fine. That our species is not marching towards its doom. The lie is our enemy, and our survival depends on fighting it. But knowing the truth isn’t enough. To beat the lie, we have to do more than know the truth. We have to live the truth. We have to act on what we know to be true. We must spread our truth to our friends, family, community, and networks. By openly discussing climate change whenever it is relevant (and it is relevant to most things). We must confront the lie wherever we see it. We must honor our truth by becoming politically and socially engaged. We must organize ourselves, to fight first the lie, then the forces that threaten our climate. By living in climate truth, we dismantle the lie. Once the lie is exposed, the severity and immediacy of the climate crisis will be broadly accepted. As people throughout all segments and levels of society wake up to the truth, we will gain political and social power. We will embark on a coordinated crisis response to climate change. We will act with the precision, dedication, and resolve. We will mobilize society like our country last did during WWII, when we transformed ourselves in order to win the war. There will be exhausting work. There will be shared sacrifice. And there will be losses. But if we, together, live in climate truth and fight back, then humanity can prevail. In his 1978 essay, the Czeck political writer Vaclav Havel argued that Czechs were largely cynical about the State, but hid their feelings and acted compliant, in order to avoid trouble. Havel wrote that much more important than what you believed about the State and its ideology was how you lived. By living “within the lie” of the State—by displaying communist propaganda, voting in phony elections, and not speaking your real opinions—people supported the lie and maintained the system, even if they privately believed the state was corrupt. One persons’ living within the lie put pressure on their families and neighbors to do the same. Havel introduced the concept of resisting the states’ lies through “Living in truth,” meaning refusing to take part in rituals or displays that one did not believe in, that one should speak one’s mind and pursue one’s goals and activities with the truth in mind, whether the State will approve or not. (The power of living in truth) does not reside in the strength of definable political or social groups, but chiefly in a potential, which is hidden throughout the whole of society, including the official power structures of that society. Therefore this power does not rely on soldiers of its own, but on soldiers of the enemy as it were—that is to say, on everyone who is living within the lie and who may be struck at any moment (in theory, at least) by the force of truth (or who, out of an instinctive desire to protect their position, may at least adapt to that force). It is a bacteriological weapon, so to speak, utilized when conditions are ripe by a single civilian to disarm an entire division…. This, too, is why the regime prosecutes, almost as a reflex action, preventatively, even modest attempts to live in truth (p.23). In 1989, Czechoslovakia had a non-violent revolution—“the Velvet Revolution”— in which massive protests and general strikes caused the Communist government to relinquish its power. During this peaceful transition of power from totalitarianism to democracy, Havel became the first elected President of Czechoslovakia. Enough people were living in truth, the lie could no longer breathe. Havel was right—when people stopped living within the lie, the lie, and the system with it, simply collapsed. The United States in 2013 may seem nothing like the Soviet Bloc in 1978. In some ways, the situations are very different. But the crucial commonality is that both systems are built on lies, and are sustained by people living within the lies. Most Americans are aware that climate change is a near-term threat to humanity. But what they believe doesn’t matter. How they live matters. By proceeding with business as usual, by living and working within the current system rather than fighting for a major social and political change—they live within the lie, prop up the lie, and maintain the collision course we are on. There are three major ways that the Climate Lie operates: Intellectual denial, emotional denial, and environmental tokenism. When people reference “Climate Change Denial” they are referring to intellectual denial. People who refuse to believe that climate change is really happening, or really caused by humans, or so forth. Naomi Oreskes has analyzed the way that the oil industry utilized corrupt and ideologically blinded scientists to sow and nurture this doubt in the American people. There has been a multi-million dollar attempt on the part of oil companies and investors, such as the Koch brothers, to assault Americans’ confidence to know about climate change. Another culprit is the media. The American media, shaped by the two-party system, is enamored with the idea that every issue has two sides, which should be given equal time, attention and respect. Climate change is continually discussed as a debated issue, not a scientific fact with terrifying implications. Further, the media propagates the climate lie by not discussing it when clearly relevant—such as when discussing extreme weather, increasingly hostile agricultural conditions, invasive species, water scarcities and droughts, with no mention of climate change. The news media, including the venerated New York Times has been cowed by the zealous lies of climate change deniers and are afraid to speak the truth. Finally, there is postmodernism, or the intellectual fad, which denies that objective truth can exist, because everything is relative, and everyone is biased by their own perspective and agenda. Though this way of thinking can be extremely interesting, it is putting us in danger. There is a scientific consensus that says human emissions are warming the climate, and that that means hotter temperatures, more extreme weather, floods, and droughts. That all squares with what I see happening, out my window and across the country and the world. I know the truth when I see it. Climate change is happening and we need to fight back. Most people who “believe” in climate change do not “feel” the affects, emotionally, of what they know. They deny their own emotional response. They do not feel terror, anger, grief, or guilt. They do not feel the pull to organize with their fellow humans and fight back against climate change. Much of this emotional denial is borne from feelings of helplessness. People feel that there is nothing they can do. That the war is already lost. Maybe they could do something if they were in Congress or a scientist, but they are just a normal person, a citizen—climate change is out of their purview. The reality of climate change is too overwhelming, so they deaden themselves to their feelings. Cynicism is a common expression of emotional denial. Many of the well-heeled, erudite, people whom I speak with about climate change tell me that “we are fucked.” Cynicism pairs intellectual belief with emotional denial and renunciation of personal responsibility and the social contract. Rather than work together to solve our shared problem, cynics declare climate change hopeless, a foregone conclusion. Cynics blame those who are in intellectual denial. They ask, “How can we solve climate change when half the country doesn’t even believe in it?” By drawing the division line between those who intellectually believe and those who intellectually deny, he absolves himself of the responsibility to live in truth. All he must do is carry the truth in his mind, and he feels on the right side of the debate, the right side of history. He fails to see how his emotional denial, his living within the lie, entrenches the status quo. Those who believe that climate change signals the End Times, and therefore oppose action to stop it, have the minimum obligation to be very clear about their opinions and the reasoning behind them. This will at least allow an open dialogue, and give non-religious people to say: “Wow, that’s a pretty big bet you are making. You are certain enough that you understand God’s will perfectly, that you are willing to risk the safety and prosperity of my family, country, and species.” By proceeding with business as usual, and failing to make beliefs about climate change and the End Times explicit, these believers entrench the climate lie. Fred Branfman, a lifelong activist and dedicated Climate Mobilizer, died two weeks ago of ALS. May he rest in peace. During the Vietnam War Fred exposed the US bombing campaign in Laos, making every attempt to stop the assault on civilians. His book, “Voices From the Plain of Jars: Life Under an Air War,” contained interviews with Laotians describing their lives within the bombing campaign. Fred stayed deeply engaged in activism and political writing his entire life, becoming increasingly focused on climate change in the nineties. He saw climate change as species-suicide and dedicated his energy to reading, writing, and action on climate. In 1996 Fred authored the “Moral Call on Climate Change” which was signed by American religious leaders, Jimmy Carter, Eli Wiesel, and many others. Fred came upon the Climate Psychologist about a year ago and wrote that it resonated with him immensely and the need for a “Human climate movement” rather than a movement for “nature” or “science.” Fred became fast friends with me, and the co-founders of The Climate Mobilization Ezra Silk, Ryan Brill. The distance between us in geography (Fred was living in Budapest), age, and experience was eclipsed by our shared commitment to fight for humanity, and our shared understanding that climate change poses a fearsome threat to civilization. You have no idea what this connection means to me. I began not only thinking about but throwing myself full-time into trying to create a “human movement” to combat climate change 15 years ago, and have mostly met with frustration ever since. So connecting with the two of you, I feel like a person who has been walking through the desert for 15 years and finally finds an oasis. Fred offered us a unique perspective on shaping a social movement. He counseled us, for example, on the tendency of activists to fight amongst each other, and the necessity of remaining respectful of our allies’ work, even if they have a different approach or intellectual framework. Our common cause is so much more important. It also helped our confidence that someone impressive and accomplished as Fred wanted to work with us! I introduced Fred to the readers of The Climate Psychologist in December and republished his powerful article, “Do our Children Deserve to Live.” In the article, Fred argues that we must realize that loving our children inherently includes leaving them a stable climate. I wish very much that Fred could have had more healthy years and been able to help grow The Climate Mobilization. He would have been loved contributing ideas and writing and being part of our community. Fred believed that contemplating one’s own death was critical to a full and rich life. He wrote the website, Truly Alive to offer people his guidance in approaching this daunting topic. Fred would be very pleased if we used the occasion of his death as a time to reflect on our own coming demise, and to use that knowledge to endow our climate action with courage and meaning. Life is precious, fragile, and finite. We happen to be alive during a time of planetary crisis. How will we use our time? Attending the People’s Climate March was exhilarating for many reasons. In the coming months, we must not let the feeling dissipate, as media attention languishes, and the memory of the march slips away. The question is how. I was there with a small team from The Climate Mobilization—a grassroots organization or “social movement start-up”—and we were handing out fliers and talking to marchers about our strategy for initiating a robust American response to climate change, the Pledge to Mobilize. I had some definite trepidation, going in. A shy person by nature, I found the idea of approaching strangers and discussing the need for a WWII-scale intervention on climate change quite daunting. I feared rejection and territoriality—that people would feel bothered by us or angry if The Climate Mobilization’s advocacy was different from their own. Liam was our most effective and enthusiastic flyer-distributer. My fears were totally unfounded. Talking with strangers has never been easier or more enjoyable than it was at the March. People were kind, interested, and thoughtful. Several took the Pledge right then and there! Of course not everyone liked the idea, and people had questions and concerns. But many people reached for fliers, many people wanted to know more, and many people said, “thank you!” when I approached them with the idea. This crowd, because of its sheer enormity, had to start and stop and start again frequently, leaving marchers toward the back motionless for hours. But the mood stayed buoyant for the duration. How can we understand these high spirits and buoyant camaraderie? Why was it that this crowd was so unusually delightful? Together, we were all living in climate truth—coming together to acknowledge the terrible reality of our situation and to demand dramatic, heroic action on climate change. To be in a group of people like this was a tremendous relief—a dramatic departure from the everyday experience of living in a culture where climate change goes largely undiscussed. Civilization is in imminent peril, but our culture is mired in denial, willful ignorance, and passivity. Feelings of fear, helplessness, and conformity generally silence discussions of climate change. 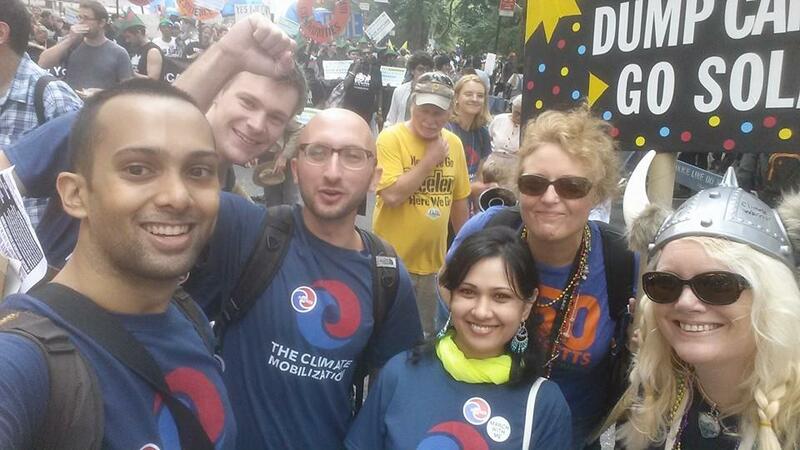 But at the People’s Climate March, we, together, overcame those barriers to facing the stark truth of climate change. People wore t-shirts saying “Save the Humans!” and held cardboard cut outs of life-preservers. The marchers got it: climate change is life versus death, collapse versus continuation of our civilization. Climate change is about me and you and my family and your family. 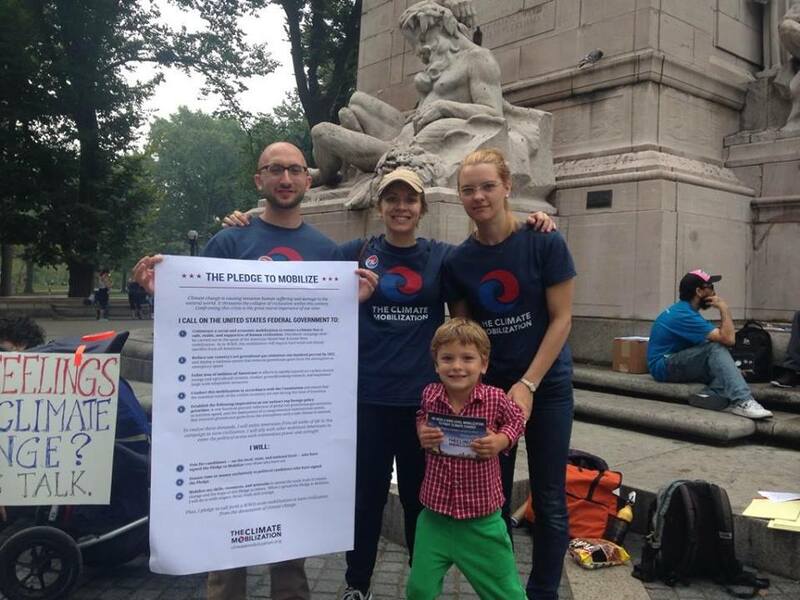 More of the TCM team, surrounded by a throng of allies living in climate truth! Two events in the march highlight this emphasis on truth—the minute of silence followed by the minute of noise. These moments expressed both our grief about the devastation of climate change—the millions of people already killed, the damage we have wrought to the natural world—and also the need to move from silence to noise. We, the people, have been silent far too long. It is time to make noise, to raise our voices, together, to acknowledge the danger of our situation and demand dramatic political action. The other moment happened when we marched past Fox News’s headquarters on 6th Avenue. The chant erupted, “Fox News, Tell the Truth!” This news channel and its affiliates have spread more lies and misinformation that any other single source. In doing this they have betrayed their fellow Americans, and put us all in danger. It was painful, then, to leave the march and walk through Times Square. where tourists, shoppers, and playgoers buzzed with energy and huge advertisements telling people what to wear, drive, and eat towered above me. Business as usual was in full swing and its participants appeared either indifferent or oblivious to the danger all around us. A woman had changed her mind about seeing a show, and was was yelling, “Who needs Pippen tickets? I’ve got Pippen tickets!” It felt so odd, to be raising her voice for such a mundane purpose. I felt like responding, “The Climate is changing! We are in danger! Who cares about Pippen?” Instead, I quickly made my way back to the marchers, and let the shared understanding of climate change wash over me. If we are going to build a social movement to save civilization from collapse, we have to spread the climate truth that the march exemplified across the entire country and world. The march was the largest climate march of all time, but now we have to grow exponentially. We will have to reach out to everyone—including people who aren’t political, who don’t understand climate change, and who try to avoid uncomfortable information. We will also need to be very clear about what we, as a movement, are demanding. It is clear that the March succeeded tremendously in its aims of movement building and message spreading, even without demands. Yet much has been made of the fact that the People’s Climate March lacked demands beyond the slogan “Climate Action” now. To elevate the movement to a position of overwhelming political power and strength, we need to unite behind concrete demands. The Pledge to Mobilize is a political platform and social movement strategy. It can allow us to spread the truth of climate change that the March featured far and wide, while providing the clear-eyed demands that the March lacked. The Pledge is a tool to help people overcome denial and effectively fight for civilization. It is a one-page document that every American can sign. The Pledge is an unblinking declaration of reality — a chance to take a stand against the great evil of our time. 1) Commence a social and economic mobilization to restore a climate that is safe, stable, and supportive of human civilization. This heroic campaign shall be carried out in the spirit of the American World War II home front mobilization. As in WWII, this mobilization will require hard work and shared sacrifice from all Americans. 2) Reduce our country’s net greenhouse gas emissions one hundred percent by 2025 and deploy a national system that removes greenhouse gases from the atmosphere at emergency speed. 3) Enlist tens of millions of Americans in efforts to rapidly expand our carbon-neutral energy and agricultural systems, conduct groundbreaking research, and implement large-scale adaptation measures. 4) Conduct this mobilization in accordance with the Constitution and ensure that the essential needs of the civilian economy are met during this time of transition. 5) Establish the following imperatives as our nation’s top foreign policy priorities: A one hundred percent reduction of global net greenhouse gas emissions at wartime speed, and the deployment of a comprehensive international system that removes greenhouse gases from the atmosphere until a safe climate is restored. In signing the Pledge, you join forces with other mobilized Americans in an urgent campaign to save civilization. You agree to spread the Pledge to people you respect and care about — such as your friends, family, neighbors, and political candidates. This Pledge has a unique structure. It is not another example of alienating Internet “clicktivism.” It is designed to be a significant event in the lives of signers. One cannot just “take” the Pledge. This Pledge must be given by someone who has already taken it. This person vouches for you, affirming that you will spread the pledge with respect, focus, truth, and courage. They also agree to support you in your efforts to mobilize yourself. Because of this person-to-person structure, the Pledge has the ability to focus dinner table discussions, and the national conversation at large, on the near-term threat of a civilization collapse as well as the massive, concerted effort needed to prevent it. Variations of the Pledge are set to launch in other countries, providing a bridge between the hyper-local, the national and the international. The Pledge to Mobilize empowers each of us to reject denial and passivity in favor of effective political and social action. It allows us to rise to the challenge of our time, together. The Pledge to Mobilize allows us to stand firm on what is non-negotiable while engaging a wide variety of people and perspectives. What is non-negotiable is written into the text of the Pledge: We must commence an all-out effort to eliminate net GHG emissions as quickly as possible, and continue to remove greenhouse gases from the atmosphere. If we are to restore a climate that is safe for humanity, this is what science and ethics demands. It is our only moral option. While the demands of the Pledge are unshakeable commitments, there is much room for discussion and debate. Issues that have historically divided the environmental movement such as nuclear power, capitalism, and reformism vs. radicalism—cannot divide and hobble us any longer. If we agree that a climate mobilization is necessary to save civilization, then we must work together towards that goal, as we discuss and debate how precisely the mobilization will unfold. Mobilizers also have the flexibility to spread the Pledge their way. People are experts in their own communities and social networks, and can appeal to them in whatever way they think will be most effective– as long as it is respectful, truthful, focused, and courageous. 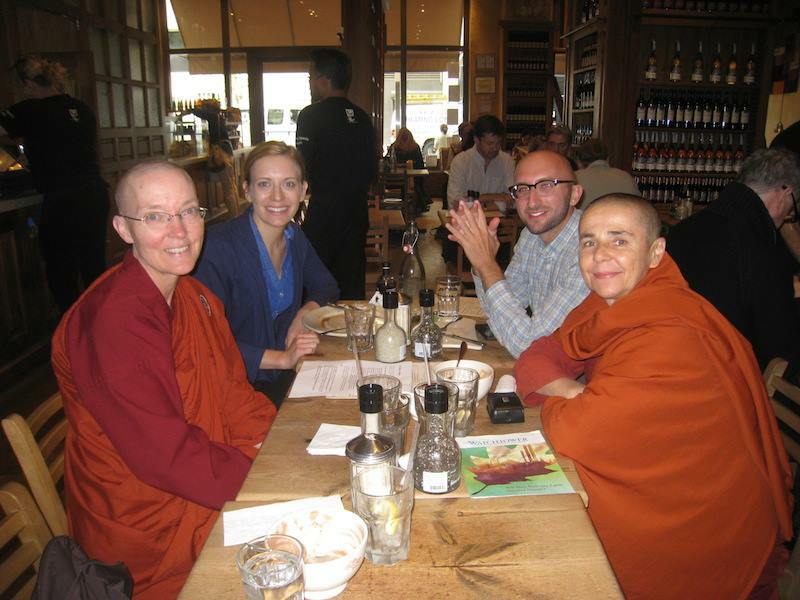 Mobilized nuns, Ayya Santussikka and Ayya Santacitta , will spread the Pledge using Buddhist traditions and emphasizing Buddhist values. The scale of the Pledge’s demands is commonly recognized as necessary among the leading lights of the environmental movement, as well as prominent economists. A WWII-scale mobilization against climate change is not a new concept—it has been and continues to be advocated by Joe Romm, Paul Gilding and James K. Galbraith, among others. In 2011, a host of leading environmentalists signed an open letter to Barack Obama and Hu Jintao, calling for the United States and China to reduce their emissions 80% by 2020 through a “wartime-like mobilization.” Signatories included: Bill McKibben of 350.org, Lester Brown, Ross Gelbspan, as well as the executive directors of the Sierra Club, Greenpeace, the Rainforest Action Network, and Friends of the Earth—all groups that were out in force at the People’s Climate March. But the Pledge’s demands, as well as its tone, have broad appeal far outside of the environmental movement. Most Americans, even many of those acutely aware of the threat of global warming, remain unaware that such a comprehensive plan exists. We have witnessed a wide variety of Americans react positively to the Pledge, including people who are politically disengaged, deeply religious, and politically conservative. This crossover appeal is vital in achieving the kind of supermajority necessary to call forth a WWII-scale climate mobilization. We expect that, as the brutal reality of global warming becomes increasingly impossible for Americans across the political spectrum to avoid, a critical mass in our nation will react with great relief to the existence of a political platform that reframes the problem as the emergency that it is. We understand that this platform will be perceived as unrealistic in our current political climate of paralysis and despair. That’s why the Pledge to Mobilize is also a social movement strategy, designed to quickly overcome our culture’s widespread denial and passivity and leverage massive public support for these scientifically necessary demands. The Pledge is a psychological tool that allows individuals, and our culture at large, to overcome the denial, dissociation, and passivity that keep most Americans from truly taking in the scope of the climate threat. The basic psychological premise is that the experience of helplessness is a key factor in denial and inaction. If we are to get millions of people to grasp the horror of the threat, and to demand an emergency climate response, we need to truthfully tell individuals that 1) a comprehensive response exists, and 2) they are an essential part of that response. In order to get people to face the truth of the crisis, we need to quickly empower them to participate in the solution. Signing the Pledge does not preclude the use of many other tactics that have been used to great effect, including demonstrations, lawsuits, internet memes and local transitional measures. On the contrary, signing the Pledge can synergistically enhance the use of other tactics. More of the team posing in front of the WWII aircraft carrier, the Intrepid. However, elections are the most basic and forceful instrument of democracy. We must focus our strategy on the huge national election 2 years away. If we elect a Mobilization Government in 2016, then our next President will have eight years to lead the mobilization and bring the United States to carbon neutrality. This gives us two years to build a momentous social movement, to spread the Pledge far and wide, and to place relentless pressure on political candidates to step up. This will take a tremendous amount of effort, to be sure. Armed with the truth, the Pledge, and the spur of dire necessity, we can transform our culture and reclaim our democracy. The Peoples Climate March was a day full of togetherness, dedication, and hope. It powerfully demonstrated that those of us who grasp the awful truth of climate change are not alone. Now, let us take that energy and passion and channel it into a comprehensive social and political strategy. Let us mobilize, and rise to the challenge of our time, together. What a weekend! The People’s Climate March was an absolutely outstanding, beautiful experience, and The Climate Mobilization had a great launch! Here is a brief update on our March activities. We talked with tons of Marchers about the Pledge, gained many allies, and received an exciting, if surprising, amount of press attention! But since this is The Climate Psychologist, I want to share the psychological, social movement strategy talk I gave on Saturday night. Many thanks to Dani Zaviceanu for filming, and to the White Institute for the meeting space! You can also watch Co-founder Ezra’s talk about his involvement in TCM part 1 and part 2, Co-founder Ryan Brill’s talk and (part of) our Q and A.
I am excited, if a little nervous, about this event! I hope you can join! If you won’t be in NYC, we are hoping to have a LiveSteam, so you can watch it at home. Please RSVP if you can come! Climate change presents us with a fundamental choice. Will we watch passively as our climate and our civilization collapse in the coming decades? Will we consign young people and future generations to lives of hunger, thirst, and violent conflict over dwindling natural resources? Or will we mobilize our entire society and economy to save civilization at wartime speed? As individuals, these questions may strike us as beyond our purview. The scope of the climate crisis, and the scale of the necessary response, feels overwhelming and out of reach. It is easy, and even comforting, to feel helpless in the face of humanity’s mounting and inter-connected environmental, social, and economic catastrophes. Because our leaders have postponed the inevitable reckoning with the consequences of our unsustainable energy system for so long, we now face an uncomfortable, yet clear-cut moral choice: Either we, as individual Americans, demand in concert that our leaders take the necessary steps to save civilization, or we stay silent, and condemn the young and the unborn to an unspeakable fate. The broad steps needed to save civilization are as clear as they are seemingly unrealistic. To avoid total catastrophe, the United States must rapidly develop post-carbon energy and agricultural systems, establish a new foreign policy that sets the emergency elimination of global net greenhouse gas emissions as our highest national priority, and deploy a comprehensive system to remove greenhouse gases from the atmosphere until a safe climate is restored. The necessary scale and speed of these efforts can only be compared to the American home front mobilization during World War II. To triumph over fascism, we rapidly restructured our society and economy to produce vast quantities of war materiel. We conducted scientific research on a grand scale, and once the war was over; undertook an emergency reconstruction of the international order. In order to triumph over climate change, we must mobilize on this scale once again. All hands must be on deck for an all-out fight against collapse. But how, in the face of political paralysis and a deteriorating international geopolitics, can we possibly accomplish this? The Pledge to Mobilize is our answer to this predicament. It is a one-page pledge that every American can sign. It is a political platform and social movement strategy that empowers every individual to participate in a heroic and effective fight against climate collapse. It is our chance to take a stand against the great evil of our time. The Pledge is an unblinking declaration of reality. It is a tool for spreading the frightening truth of climate change, and the hope of the Climate Mobilization, from person to person. It is a means to reclaim our democracy and to save our nation from ruin. When you sign this pledge, you commit your support to political candidates who have also signed it, on the local, state, and national level. The Pledge calls on the federal government to commence a heroic, WWII-scale social and economic mobilization that reduces our national net greenhouse gas emissions 100 percent by 2025, enlisting tens of millions of Americans in efforts to rapidly overhaul our fossil fuel-dependent energy system. The Pledge also demands a new foreign policy that prioritizes the reduction of global net greenhouse emissions to zero at wartime speed as our foremost national imperative. In signing, you join forces with other mobilized Americans in this campaign to save civilization. You agree to spread the pledge to people you respect and care about — including friends, family, neighbors, and political candidates. The Pledge is designed to be a significant event in the lives of those who sign it. One cannot just “take” the Pledge. It must be given by someone who has already taken it. This person vouches for you, affirming that you will spread the pledge with respect, focus, truth, and courage. They also agree to support you in your efforts to mobilize. Because of this person-to-person structure, the Pledge has the ability to focus dinner table discussions, and the national conversation at large, on the near-term threat of a civilization collapse as well as the massive, concerted effort needed to prevent it. Variations of the Pledge will launch in other countries, providing a bridge between the hyper-local, the national, and the international. The Pledge to Mobilize will empower each of us to reject denial and passivity in favor of effective political and social action. It allows us to rise to the challenge of our time, together. The climate is changing. Our planet is in the early stages of a severe warming that, failing a massive human intervention soon, will last for centuries. The warming — .8°C above pre-industrial levels to date — is set to accelerate in the coming decades. The predominant cause is greenhouse gas emissions caused by fossil fuel burning. Despite decades of warnings from the scientific community, global greenhouse gas emissions are setting new records every year. A worst-case scenario is unfolding before our eyes. During the 12,000 years in which human agriculture and civilization have developed, the climate has been stable — staying within a 1°C temperature range. But scientific projections suggest that, unless we alter humanity’s greenhouse gas emissions trajectory drastically in the coming years, global average temperatures could increase 4°C above preindustrial levels at some point between 2060 and the turn of the century. Planet Earth, creation, the world in which civilization developed, the world with climate patterns that we know and stable shorelines, is in imminent peril. The urgency of the situation crystallized only in the past few years…The startling conclusion is that continued exploitation of all fossil fuels on Earth threatens not only the other millions of species on the planet, but also the survival of humanity itself — and the timetable is shorter than we thought. The arrangements that we rely on are unraveling. We have already gone too far. The early effects of climate warming are already destabilizing civilization, even though, due to the inertia of the global climate system, we are only now suffering the consequences of greenhouse gases that were emitted between thirty and fifty years ago. The signs of disastrous climate change are everywhere. Extreme droughts, floods, and wildfires, as well as quickly migrating invasive species and vector-borne diseases, are already damaging agriculture and infrastructure, and creating tens of millions of displaced people. The total number of reported severe weather events has increased nearly five-fold since the 1970s. These harsh climatic conditions, combined with the end of cheap oil and the growth of corn-based ethanol fuel consumption, have sent food prices skyrocketing. Historic food price spikes in 2008 and 2011 contributed to the successive waves of civil unrest that have swept the globe, toppling governments and unleashing violent sectarian tensions. The Institute for Economics & Peace found a 5 percent decline in its Global Peace Index between 2008 and 2013, with 110 of the countries surveyed becoming less peaceful. In the estimation of the U.K. government’s chief scientist, humans face a “perfect storm” of energy, food and water scarcity crises by 2030. This gathering storm, driven by climate change the explosive growth of populations and resource-intensive economic activity, is homing in on our shoreline: California withers, beset by a historic drought. Miami is inundated by floods. Our cities and croplands are being pummeled by hurricanes, wildfires, blizzards, flash floods and drought on an unprecedented scale. Our leaders have justified their obstruction by contending that the American way of life is not negotiable. But responding vigorously to climate change is our only chance to preserve the best aspects of the American tradition. On the brink of WWII, President Roosevelt enumerated four freedoms that were quintessential to the American way of life: Freedom of speech, freedom of worship, freedom from want, and freedom from fear. Did our parents and grandparents protect these freedoms from fascism, only for us to squander them as we yield to a new dark age of climatic disruption and societal breakdown? Climate catastrophe poses a clear and present danger to the American experiment. A massive drought lasting from 2006 to 2010 directly contributed to the chaos that has engulfed Syria since 2011. It was the worst drought in Syria’s modern history. Impoverished farmers suffering from the drought migrated to urban areas shocked by high food prices and helped to ignite the revolt against Bashar al-Assad. The ensuing civil war destabilized the entire region. Into the breach has stepped ISIS, a brutal group known for persecuting and murdering religious minorities, beheading American journalists, and using dams as weapons of war. The logical endpoint of our current trajectory is tyranny, catastrophic social breakdown and unprecedented human suffering. Freedom and democracy have no future in a collapsed civilization. The future is in our hands. And so the fate of humanity falls to us. Will we continue to passively watch our leaders delay and prevaricate as civilization unravels? Or will we reclaim our fallen democracy and mobilize our society to fight climate change? The decisions we make in the coming months and years will have momentous consequences for the future of human civilization and every other species on this planet. We have reached our hour of decision. We have been here before. In the late 1930s, the Axis powers of Japan, Italy, and Germany threatened our freedom, stability, and safety. Americans denied the truth of this threat for years, imagining that we could somehow stay out of the war. But the Pearl Harbor attacks shattered the nation’s denial. Isolationism — a bi-partisan phenomenon — collapsed overnight. Suddenly, Americans awoke to the truth that we were in terrible danger and that we had to mobilize for war immediately. Thanks to the visionary leadership of President Franklin Delano Roosevelt, who had warned of a coming international conflagration since 1937, we did so — with stunning success. The task of harnessing a nation’s economic potential for war has come to be known as “economic mobilization.” Its basic purpose is to insure the procurement of finished munitions — the sum total of equipment, supplies, and services required by the armed forces — while at the same time supplying the essential needs of the civilian economy. The demands of modern technological warfare, when suddenly thrust upon a nation lacking the specific equipment for war, are so novel, so complex, and of such magnitude that their fulfillment requires a nationwide industrial and social revolution. Such a revolution does not automatically “occur” when a nation goes to war. It must be planned, directed, and carried out in a manner which will accomplish its objectives with a minimum of hardship and dislocation. This “industrial and social revolution” that the U.S. underwent after Pearl Harbor was staggering. Conservative business titans joined labor leaders and liberal bureaucrats — after years of bitter acrimony over the New Deal — to redirect and refocus America’s industrial might against the Nazis Factories rapidly converted from producing consumer goods to producing tanks, guns and planes, shattering all historical records for war production. Scientists and universities pumped out research on behalf of the war effort — leading to huge technological and intellectual breakthroughs. Young men sacrificed their lives fighting for their country. Women surged into factories and planted “victory gardens” that supplied 40% of America’s vegetables during the war. More than 10% of the population relocated, often across state lines, in order to find a “war job.” All hands were on deck. All Americans worked toward a common goal. This is precisely the level of focus, cooperation and planning that we need if we are to counter the destructive force of climate change. Smith’s comments regarding the novelty, complexity, and magnitude of the demands of modern warfare absolutely apply to the challenge posed by the climate crisis. The need for the United States to mount a WWII-level mobilization to protect ourselves from climate change has support from top scientists, environmental analysts and even national politicians. A Climate Mobilization would allow our country “to adapt to what we can’t avoid, and avoid what we can’t adapt to.” As in World War II, all Americans would contribute. Industry would transform to maximize energy efficiency and produce the hardware needed for our post-carbon energy infrastructure. Universities would research methods to improve existing renewable and post-carbon energy technologies, increase energy efficiency, and maximize the resilience of our energy, transportation and agricultural systems in anticipation of the coming ecological disasters. Farmers would bind massive quantities of carbon into the soil and learn to implement techniques that are more resistant to floods, droughts and invasive species. Existing government agencies, including the military, would shift their focus toward this super-ordinate goal. Citizens would plant trees, reduce energy use at home and take part in community adaptation and mitigation projects. We would grow community gardens, install solar panels and prepare low-lying areas for increased flooding. We would build bike lanes and paint roofs white to diminish the effects of extreme heat waves. But how do we get there? A full-scale mobilization requires both inspired government leadership and the consent, cooperation, and enthusiasm of the population. Before the Pearl Harbor attacks, the vast majority of Americans were staunchly isolationist, imagining that we could avoid the war. The surprise attack at Pearl Harbor decimated much of our naval fleet and fundamentally changed the mood of the country. Isolationism evaporated overnight and Americans threw themselves behind the war effort. The vast majority of Americans were dedicated — even enthusiastic — participants in the WWII home front mobilization. Various writers have held out hope that a catastrophic natural disaster will be the “Pearl Harbor” of climate change. Yet we have already been struck by Hurricane Katrina and Hurricane Sandy, and ravaged by wildfires in Colorado and momentous droughts across California and the Midwest. No spontaneous awakening has occurred. Indeed, denial and apathy reigns. A 2014 Gallup poll surveying American anxiety about national problems ranked climate change second to last, below such concerns as terrorism, illegal immigration, and drug abuse. Although the government must coordinate the mobilization, the social momentum needed to drive the mobilization onto the agenda will not originate in Washington. Those of us who grasp the extent, immediacy and horror of the threat must build a social movement that wakes America up to the enormity of the climate threat and the necessity of an immediate climate mobilization. 2) Reduce our country’s net greenhouse gas emissions one hundred percent by 2025 and deploy a national system to remove greenhouse gases from the atmosphere at emergency speed. 5) Establish the following imperatives as our nation’s top foreign policy priorities: A one hundred percent reduction of global net greenhouse gas emissions at wartime speed, and the deployment of an international system that removes greenhouse gases from the atmosphere until a safe climate is restored. To realize these demands, I will enlist Americans from all walks of life in this campaign to save civilization. I will ally with other mobilized Americans and enter the political arena with tremendous power and strength. I) Vote for candidates — on the local, state, and national level — who have signed the Pledge to Mobilize over those who have not. II) Donate time or money exclusively to political candidates who have signed the Pledge. III) Mobilize my skills, resources, and networks to spread the stark truth of climate change and the hope of the Climate Mobilization to others. When I spread the Pledge, I will do so with respect, focus, truth, and courage. Thus, I pledge to call forth a WWII-scale mobilization to save civilization from the devastation of climate change. The Pledge to Mobilize is designed to spread in a new way. An individual cannot just take the Pledge — it can only be given by someone who has already signed it. Since every signer promises to spread the Pledge to others — every Pledge signer becomes a Pledge giver. The giving and taking of the Pledge creates new ways of interacting around climate change. The Pledge signer can play the role of teacher, mentor, missionary, and friend. Those who sign the Pledge approach people they respect and care for to discuss the climate crisis and the Climate Mobilization. The Pledger, as part of their recruiting efforts, can share articles and videos or invite their friend to attend presentations of local Climate Mobilization groups. By spreading the Pledge, you disrupt our culture of silence and willful ignorance. There are nearly infinite ways to use the Pledge as a tool to catalyze an emergency response to climate change. Pledgers can leverage their unique talents, expertise and relationships. They can host events at their homes, or in the community. Religious people can spread the Pledge in their communities of worship, and climate educators can offer the Pledge after their presentations. 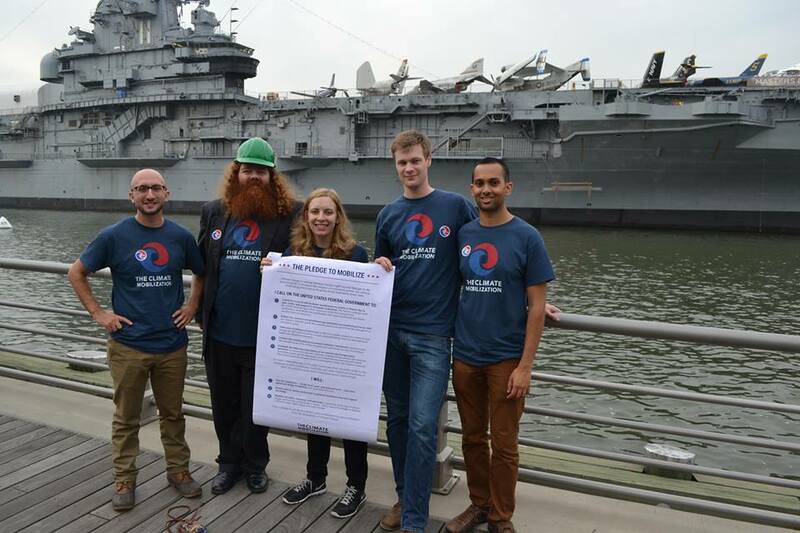 Mobilizers can spread the Pledge independently, or create informal Pledge spreading groups. Some Mobilizers will want to bring the Pledge to their community in a more structured way. These individuals can start or join local Climate Mobilization groups. Formal Climate Mobilization groups will offer a weekly public presentation on the climate crisis and the Climate Mobilization. They will also identify prominent and well-respected individuals in their community — politicians, business people, labor leaders, university deans, clergy, etc. — and approach those individuals with the Pledge. If those individuals decide to sign, the local group will publicize this event in local media. Signing the Pledge does not preclude the use of other tactics, including demonstrations, lawsuits, internet memes and other measures. On the contrary, signing the Pledge often serves as a launching pad to further engagement. Pledgers can coordinate actions amongst each other. For example, a Pledge signer could combine political demonstration with direct relief in areas hard-hit by storms; coordinate social media campaigns to pressure journalists to cover climate change with greater seriousness; or plant community victory gardens. A mobilized citizen could persuade their city council to pass a resolution calling for ta WWII-scale climate mobilization. Follow-up on the resolution could include local efforts to install renewable energy systems, localize agriculture, and implement a community adaptation plan. The function of the Climate Mobilization website is to help make every person who signs the Pledge be the most effective advocate that they can be. To this end, we offer a series of frequently asked questions and frequently raised objections, guidelines for effective and ethical Pledge spreading, and discussion forums where Pledge signers can meet, form or join groups, share tips, make plans and provide encouragement. The website also tracks and displays how many people each Mobilizer has recruited, how many people their recruits have recruited, and how many people their recruits have recruited, showing each Mobilizer their cascading impact. In the face of political paralysis, many environmental groups have invoked the Civil Rights movement and resorted to tactics of protest and civil disobedience in opposition to fossil fuel infrastructure projects. Although these admirable and heroic efforts have led to significant victories and captured the imagination of many young people, they have not succeeded in mobilizing the country for immediate action. Inventor Buckminster Fuller wrote, “You never change things by fighting the existing reality. To change something, build a new model that makes the existing model obsolete.” The Civil Rights activists demonstrated the need to make the Jim Crow system obsolete, while enacting the new way of life — integration and equality — that could replace it. White Americans could no longer pretend that race relations did not concern them. They were given a choice between the brutal past and a future that, because of civil disobedience, they could begin to visualize. So far, neither civil rights-era tactics, nor the popular approach of “climate change education” have offered a clear way forward for the individual or society. When confronted with a huge, complex problem that appears to have no solution, most people feel terror and helplessness, and unconsciously insulate themselves with a variety of defensive techniques, including dissociation, willful ignorance, numbing, repression, denial, and demonization of the messenger. When information about the climate crisis is not paired with ways that individuals can participate in heroic and effective political action, many of us feel helpless and overwhelmed, and fail to integrate the startling reality of climate change into our everyday lives. The Pledge to Mobilize provides a clear, comprehensive way forward for society and for individual signers. Pledges have become a powerful force in American politics in recent decades, especially within the conservative movement. Grover Norquist has achieved substantial influence over the Republican Party through his “Taxpayer Protection Pledge”, and the Koch brothers have persuaded 169 Congressmen and women, including the entire Republican House leadership, to pledge not to institute a tax on carbon! Historically, pledge campaigns have spurred rapid social transformation. The pervasive Chinese practice of foot binding was overturned in a generation through the spread of an anti-footbinding pledge among noble families. Pledges can combat denial so effectively because signers publicly pledge their allegiance on behalf of a cause. The Pledge to Mobilize does not specify precisely how the Mobilization will be accomplished. Given that we were designing a tool for a social movement, rather than a governmental policy, we decided not to lock ourselves into inflexible policy prescriptions. This allows us to focus attention on the crucial issue: The need for an emergency response to climate change. We hope to avoid a situation in which people of good faith are pitted against each other over traditionally divisive issues; such as whether the future energy mix should include nuclear power, or whether economic growth is an outdated model. The Climate Mobilization should encompass people with a range of viewpoints, and differences can be explored through ongoing discussion. We stand a chance only if we allow our shared purpose — fighting for humanity’s future — to transcend the divisions that presently distract us. There is a wealth of partial and comprehensive mobilization and decarbonization plans that we can draw upon in the months and years to come (a non-exhaustive list can be found in Appendix B). As the Pledge to Mobilize spreads, experts across many relevant fields as well as active citizens will take part in mobilization discussions, refining existing plans and offering new ones. When local, state and federal governments, under immense pressure from their constituents, finally declare a climate emergency, extensive action plans will be available to guide them. Some people may agree that the United States must cut emissions as quickly as possible, but argue that it is poor strategy to advocate for this publicly, as the stark truth of climate change, and the necessary economic and social transformation, will overwhelm and “turn off” most Americans. This, we disagree with. Our culture is mired in denial, silence and willful ignorance. The process of spreading the Pledge will create a sea change in the public perspective. Successful social movements fundamentally alter how a society understands and, ultimately, governs itself. Some will argue that such reductions in emissions would devastate the economy, but this argument ignores the fact that the American carbon-powered economy is stagnating, in large part due to daunting oil supply constraints related to the steeply decreasing energy return on energy investment for global oil production. The 2008 crisis was exacerbated, and possibly even driven, by the spiking price of oil. Since the financial crash, millions of Americans have suffered from the devastating consequences of layoffs, stagnant wages and foreclosures. This process is almost certain to continue. The Organization for Economic Cooperation and Development has forecast a doubling in the price of crude oil by 2020 — an event that would devastate the world economy if we try to continue our reliance on oil. A rapid, government-coordinated transition away from fossil fuels offers Americans a chance to actively and creatively transform the economy while maintaining the climatic conditions to support human civilization. But how will we fund this mobilization? The precise answer will be determined by the American public, mobilization planners and political leaders. Defense spending during WWII, which increased from about 3 percent of the gross domestic product in the late ‘30s to approximately 41 percent at the peak of the war effort, was financed primarily through the sale of war bonds, temporary taxes on excess corporate profits, and income tax increases, especially for top earners. The Climate Mobilization could be financed through various measures, including mobilization bonds, a carbon tax, a financial transactions tax, Superfund payments or tax hikes on large corporations and high earners. When a society and its governing policies become too deeply estranged from reality, the truth holds tremendous transformational potential. But to transform society, this truth must not merely be known. It must be lived. That was Vaclav Havel’s key insight — a message that guided the people of Czechoslovakia through a bloodless revolution against the Soviet Union. Czechs had long been cynical about the Soviet state, privately believing that the government was corrupt. Still, they outwardly complied with state rituals and ceremonies for years, fearing social isolation and state persecution. It was only after citizens started to live their values outwardly — by refusing to display Soviet propaganda, vote in sham elections or self-censor conversations — that they caused a revolution. “Living in truth,” as Havel called this strategy, derives its power from humanity’s social nature. We evolved in tribes, and developed brains that are highly attuned to the attitudes, emotions, and appraisals of others. We generally abhor standing apart from the group, especially if we risk being shamed or ostracized. By acting publicly on their political convictions in their day-to-day lives, Czechs implicitly invited others to join them in challenging the state. They drew strength from each other. The Pledge to Mobilize invites and challenges ordinary citizens to engage meaningfully and publicly with the greatest issue of our time. Civil disobedience brought the issue of civil rights to the forefront of the American consciousness. Every American had to decide where they stood on civil rights, and many activists made their involvement central to their identity. Through the vessel of the pledge, we can accomplish this for climate change. We can impel people to make a conscious choice: Do you stand with human civilization, or do you favor collapsing into deprivation, chaos, and war? Nightmarish problems require heroic responses. Too often climate change is presented as a gargantuan problem with a bizarrely inadequate solution: “Want to prevent the collapse of civilization? Turn off your lights when you leave the room.” This is experienced as inauthentic and can cause people to emotionally disengage. Americans ought to be addressed as citizens, not electricity consumers. To bring our country out of denial, we need to offer a response commensurate with the scale of the problem itself. We are bombarded by information and stimulation from computers, smartphones, video games and hundreds of television channels, making it all too easy to enter a trance-like state and avoid thinking about the climate crisis. The Pledge to Mobilize can break through the high-speed, fragmented media landscape, since it relies on personal appeals within existing relationships. Further, the Climate Mobilization is using the awesome power of the Internet and social media to spread our message. The Pledge strategy can be adapted and implemented in every country. As the Pledge spreads in the United States, it will draw the attention of allies all over the world, who can adapt the Pledge to their own country’s unique context. An extraordinary group of Australians is already exploring ways to make the pledge strategy work in their country. Small groups of Canadians, Britons, and South Africans are starting to get on board, as well. We will attempt to translate the Pledge and its supporting documents into as many languages as possible, allowing the strategy to spread far beyond the English-speaking world. The Pledge strategy is not dependent on election cycles, because sitting politicians are encouraged — and, if necessary, pressured — to sign. Mobilizers will call their Representatives to say, “I have supported you for 10 years with my vote, time, and money. But I recently signed the Pledge to Mobilize and I will no longer do so unless you sign it as well.” However, elections are the most basic and forceful instrument of democracy. We must focus our strategy on the huge national election two years away. If we elect a Mobilization Government in 2016, then our next President will have eight years to eliminate national net greenhouse gas emissions and build an international coalition to drive global emissions to zero. This gives us two years to build a momentous social movement, to spread the Pledge far and wide, and to place relentless pressure on political candidates to fight for civilization. This will take a tremendous amount of effort, to be sure. But armed with the truth, the Pledge, and the spur of dire necessity, we can transform our culture and reclaim our democracy. Climate change is an unprecedented challenge. Never before has humanity marched in lockstep towards the destruction of our global civilization. We have the opportunity, and the moral duty, to make a meaningful difference in the course of human history. We must face this growing crisis with courage, dedication and resolve. Let us first mobilize as individuals who will transform our culture of silence and denial into a culture of active emergency response. Only then can we mobilize as a society to fight climate change, itself. A number of generous allies provided extremely helpful and honest feedback on this paper. Special thanks to Philip Sutton for his sage advice and painstaking research on the latest science and safety standards. The Climate Mobilization logo was designed by Katharine Woodman-Maynard. The header photo, “Raising Sustainability On America,” was designed by Joseph Durago. Appendix A: Reasoning behind 100% net reductions by 2025. Our call for zero net emissions is based on a simple premise: The concentration of greenhouse gases in the atmosphere today is unsafe for humanity. Since it is unsafe, we must first halt net emissions of these heat-trapping gases. Then, we must remove greenhouse gases from the atmosphere until concentrations are stabilized at safe levels. Since we have already gone too far, we must drive net emissions to zero at wartime speed. The international negotiations under the United Nations Framework Convention on Climate Change currently operate on the assumption that global mean temperatures should be stabilized no higher than +2 ºC above the pre-industrial level and, until recently, a 50% probability of success was assumed. In the IPCC 5th Assessment report, however, data was provided on three probabilities of success: 33% (1 in 3), 50% (1 in 2), and 66% (2 in 3). These probability assessments are completely out of line with modern safety standards. Over the past 250 years, the conception of industrial safety shifted from an acceptance of an elevated risk, to aspiring to low levels of danger with modest risk of failure (1 in 1000 to 1 in 10,000), to today’s view that the target safety standard should be zero harm, the risk of failure should be negligible, and the design process should constantly pursue zero failure objectives. Today, industries, such as the airlines, pursue failure rates well below 1 in 1,000,000. The current official approach to climate change corresponds with the industrial safety approach prevailing about 200 years ago – that elevated danger must be accepted and that, by 2050, climate conditions will be stabilized well outside the pre-industrial range e.g. at 450 parts per million (ppm) of CO2 in the air (compared to the pre-industrial level of 280 ppm) with a 50% chance of failing to achieve the temperature stabilization goal of no higher than +2 ºC above the pre-industrial level. CO2 concentrations recently surpassed 400 ppm, far above the levels now considered safe for civilization. Unfortunately for humanity, 2ºC of warming would cause dangerous, irreversible impact and trigger positive feedbacks that further accelerate warming. A temperature increase of only 1.5ºC will melt the whole of the land-based permafrost in the Arctic, affecting about 1500 billion tons of stored carbon — 3 times the carbon released to the air so far by fossil fuel burning. A temperature increase of 1.6ºC is likely to be enough to melt most of the ice in Greenland. The ice sheet losses from the West Antarctic and Greenland caused by a +1.6ºC warming would be enough to cause at least 33 feet of sea level rise. If modern industrial safety standards were applied to the earth’s climate, then the climate goals and the acceptable risk of failure would have to change dramatically: The target climate conditions would be set within the range that existed during the Holocene era (the 12,000 years before the industrial era) – because these are the conditions known to be safe for civilization and for humanity and the 20 million or so species of life on the planet, and there would need to be a negligible acceptable risk of failure. Kokic, Crimp, & Howden, 2014 A probabilistic analysis of human influence on recent record global mean temperature changes, Climate Risk Management, Volume 3, 2014, Pages 1-12. Betts et al., The UK Met Office, 2009. “When could global warming reach 4 degrees Celsius? Manning, 2011. “Too hot to handle: can we afford a 4 degree rise?” The Sydney Morning Herald. Damage to agriculture: Gillis, 2013; US Department of Agriculture, 2012. Damage to infrastructure:McKibben, 2010; US Department of Energy; Civil wars and climate refugees: US Department of Defense;(International Displacement Monitoring Center, 2009); International Organization for Migration, 2013. Food prices and unrest. Lagi, Bertrand, and Bar-Yam, 2011. “Perfect storm” of crises. Beddington, 2009. The 2009 Copenhagen Accord, a non-binding international agreement, commits the United States to a very weak target that would have us reduce emissions 17% below 2005 levels by 2020. Army and Mobilization. Smith, 1957. Herman, A. (2012). Freedom’s forge: How American business produced victory in World War II. Random House: New York. The Atomic bomb was the most ambitious—if morally suspect—of the these breakthroughs. Though destructive, violent, and morally suspect, the Manhattan Project illustrates the incredible things that are possible when the scientific community focuses on a common problem. For more on the inspiring history of the mobilization on the home-front during WWII, see Goodwin, 1995. Indeed, in 2011 the executive directors of the Sierra Club, Greenpeace, the Rainforest Action Network, and Friends of the Earth, among others, signed a letter to President Obama and Chinese Premier Hu Jintao calling for a “wartime-like” mobilization to reduce global carbon emissions 80 percent by 2020. A WWII Mobilization is advocated by Al Gore, Bill McKibben, Lester Brown, Joe Romm, Paul Gilding, David Roberts, and many others. Hillary Clinton alluded to the WWII mobilization in a 2007 campaign speech on climate and energy issues, saying “For this generation of Americans, climate change is our Space Race. It is our home-front mobilization during World War II and it is our response to the Great Depression.” Bryan Walsh of Time published a cover story in 2008 that called for a WWII-style “War on Global Warming.” There is also a contingent of climate writers and advocates, includingJill Stein and Thomas Friedman, who prefer the historical metaphor of the New Deal. Rifkin, 2014. “Climate Change Not a Top Worry in US.” Gallup Politics. See Ganz, 2010 on the importance of building relationships and encouraging engagement for the success of social movements. See Morris, 1999 for a thorough discussion of denial-fighting power of civil disobedience andBodroghkozy, 2012 for the role of television in particular. See McAdam, 1988 for a vivid demonstration of this process. For an elaboration of how psychological defenses function on an individual level, see McWilliams, 2011; for how cultures and societies defend against overwhelming information, see Cohen, 2001. No Climate Tax. Americans for Prosperity. See Appiah, 2010 for a case history of the anti-foot-binding movement, and an examination of how shame and honor shape social movements. See McWilliams, 2011 to understand how denial operates among individuals, for how cultures and societies deny see Cohen, 2001. For a discussion of how denial functions specifically in climate change, see Norgaard, 2011. U.S. 2020 emissions target. Spross, 2014. EROI and growth prospects. Murphy, 2013. Oil price forecast. Fournier, 2013. Fossil fuel corporations will be encouraged to rapidly shift into producing post-carbon forms of energy and relinquish their efforts to subvert the democratic process. If they refuse to move into the future, the government will serve as employer of last resort for their laid-off employees. During WWII the government directly hired millions of people—most prominently in the Armed services. However these direct hires were supplied through networks of private enterprise that partnered with the government, often utilizing “cost plus profit” contracts. See Goodwin, 1995 or the National WWII museum’s America Goes to War. For more on Luther’s innovative use of the printing press, see: Standage, 2011. See Thomas, 2004 and Bodroghkozy, 2012 for the role of television in in the Civil Rights Movement. IPCC, 2014. Fifth Assessment Report. Sutton, 2014. A Review of the History of Safety. Vaks, A., O.S. Gutareva et al. (2013) “Speleothems reveal 500,000-year history of Siberian permafrost”, Science 340: 183-186. Greenland ice sheet melt has an uncertainty range from +0.8 ºC to +3.2ºC). Spratt, 2013. Is climate change already dangerous? Climate Code Red. Many extreme weather events which have been made dangerously worse by climate changes such as alterations to the Jet Stream – including Superstorm Sandy, Typhoon Haiyan and extraordinary heat waves (eg France in 2003 and Russia in 2010) and floods (eg. Pakistan in 2010) – and poleward shifts in the major atmospheric cells thus causing huge local impacts through shifts in the location of low and high rainfall patterns. Tang, Q. et al. (2013). “Extreme summer weather in northern mid-latitudes linked to a vanishing cryosphere”, Nature Climate Change 4, 45–50. Net emissions refers to any residual gain in emissions from a technology after total emissions and total withdrawals of greenhouse gases are balanced out. For example it would be possible to have a net zero emissions transport system if cars burned methanol in their engines, provided the methanol was synthesized, for example in fuel cells, out of CO2 and water and the energy used to drive the synthesis came from renewable energy (eg. wind or solar electricity). Unless CO2 is actively taken out of the air and stored (eg. in soils or geological formations) or other cooling methods applied (eg. solar reflection) “the combination of a 2°C warming target with high probability of success (eg. 90% or more) is now unreachable”. This means that, with a safety standard that is adequately stringent, there is no carbon budget left for any country. As a consequence the only appropriate emissions target is now a 100% cut for all countries. Raupach, M. R., I.N. Harman and J.G. Canadell (2011) “Global climate goals for temperature, concentrations, emissions and cumulative emissions”, Report for the Department of Climate Change and Energy Efficiency. CAWCR Technical Report no. 42. Centre for Australian Weather and Climate Research, Melbourne. Achieving a net zero emissions economy is not enough to cool the planet as a whole in any meaningful time scale. Many research teams [Meehl et al. (2007), Mathews & Caldeira (2008), Lowe. et al. (2009), Solomon et al. (2009), Gillett et al. (2011)] have examined zero CO2 emissions scenarios and have shown that, due to complex dynamics strongly influenced by the thermal inertia and CO2buffering of the oceans, dropping emissions to zero stops the warming trend (provided there are not already very strong positive feedbacks from the natural carbon cycle) but does not lead to a significant fall in the temperature in less than several thousand years. The global temperature occurring at the time the zero emissions policy is applied is approximately the temperature that is maintained over the long term (if zero emissions is the only climate measure adopted). Given that we are clearly some years off the possibility of fully applying a zero emission strategy globally, the temperature that would be maintained at the point of full deployment of a zero emissions strategy would be a little higher than at present. If the zero emissions policy was fully implemented by 2020 then the temperature at the time might be approximately +1ºC and if completed by 2030 the temperature might be about +1.2ºC. The Gillett et al. (2011) study concluded that although zero emissions translates to essentially a stable temperature – for in excess of a thousand years – in the simulation runs different zones of the earth react rather differently. The northern hemisphere cools significantly bringing some relief to the Arctic, but over the 1000 years of the model run heat continues to build up in the Southern Ocean putting stress on the stability of the West Antarctic ice sheet and the sea level also rises over the entire time because of the heat build up in the Southern Ocean. This hemispherically differentiated response suggest that much of the northern hemisphere would benefit from cooling with a zero emissions policy in place, but in the absence of any additional measures, continued heating in the southern hemisphere would cause conditions to continue to deteriorate for humans, ecosystems and species in the oceans and on the land masses. Gillett, N. et al.. (2011). ‘Ongoing climate change following a complete cessation of carbon dioxide emissions’ Nature Geoscience. pp. 83–87. Meehl, G. A. et al. (2007). in IPCC Climate Change 2007: The Physical Science Basis (eds Solomon, S. et al.) 747-845: Cambridge Univ. Press. Solomon, S et al. (2009). ‘Irreversible climate change due to carbon dioxide emissions’. PNAS. A 2009 report to WWF calculates that global warming can only be held to a too-high +2ºC (if all major economies in the world have, by 2014, geared up all the needed industries to grow very fast by conventional standards to deliver the required emissions cuts by 2050. Given the world’s current level of mobilization, the required conditions cannot be met with conventional fast economic reform. The report indicated that if these industrial conditions are not met, more than +2ºC of warming can only be avoided if the global economy goes onto a war-footing. The People’s Climate March September 21st will likely be the largest march for climate action that has ever taken place. We should be grateful to the organizers and sponsoring organizations for putting so much time, energy, and resources into persuading tens (or hundreds!) of thousands of people to come to New York City. The march will bring passionate people together from across the world, to demand a response to climate change, and to make connections with each other, creating a broader movement going forward. The march has already accomplished a good deal in terms of raising awareness– and people’s spirits– while focusing on inclusivity and diversity. There is much to be proud of here. However, the People’s Climate March has faced sharp criticism in recent weeks. Christopher Hedges charged that the march will be nothing more than a “climate-themed street fair,” given that it will lack formal demands and speeches and will adhere to the demands of state authorities. While Hedges passion is to be admired, his proposed strategy is vague and unpersuasive. What are the revolt’s demands and how will they be accomplished? He calls for marchers to “disrupt” the machinery of corporate capitalism, and to establish self-sufficient local communities. But how, precisely, will disruption and local action lead to drastic and rapid emissions reductions? How could it usher in the war-time mobilization widely regarded as necessary to stave off catastrophic climate disruption? Hedges barely goes there. Direct action is a tactic, but not, in itself, a comprehensive theory of change. Hedges argues that if “we play by the rules, we lose.” Fair enough. “The rules” as they currently exist are destroying the climate and placing all of humanity in peril. But breaking the rules is thinking too small. We need to rewrite the rules. We face the prospect of billions of people starving to death within this century. Each and every one of us has a profound moral responsibility to ensure that this horrific fate is averted. We need to stop wringing our hands and pointing fingers. It’s time for all of us to get to work on serious, constructive movement building. In the coming months and years, we must forge a powerful campaign that encompasses large swaths of American society. This movement will necessarily include Americans of all creeds, colors, classes and political affiliations. Its primary demand is clear if success is to be assured: The federal government must lead a social and economic mobilization to save civilization from climate change. This movement will enlist allies in the press, the universities, the foundations, and the non-profit sector. It will move with tremendous power into the political arena. How do we even begin to approach this challenge? This is the question that The Climate Mobilization, a new organization— staffed entirely by volunteers and funded by individual donations—has begun to tackle. For the past year, we have developed a strategy to address the predicament that Chris Hedges has so eloquently described in his numerous books and articles. Now, on the cusp of the People’s Climate March, we are ready to launch. Yet unlike Hedges, we do not believe that the coming march is a lost cause. On the contrary, we believe that the march holds extraordinary promise. It is the march’s very lack of demands that is the source of its potential. On Sept. 20, we will launch the Pledge to Mobilize in New York City. We invite all those coming to New York City to sign this pledge, which contains demands powerful and honest enough to propel the march into the history books, and the climate movement on the road toward victory. Once the march is done, we hope those who sign it will take the Pledge back to their home communities to begin the hard work of local movement building. The Pledge to Mobilize is a political platform and social movement strategy. It is a one-page document that every American can sign. The Pledge is an unblinking declaration of reality – a chance to take a stand against the great evil of our time. The Pledge to Mobilize allows us to stand firm on what is non-negotiable while also serving as an umbrella organization that engages a wide variety of people and perspectives. What is non-negotiable is written into the text of the Pledge: We must commence an all-out effort to eliminate GHG emissions as quickly as possible, and continue to remove greenhouse gases from the atmosphere. If we are to restore a climate that is safe for humanity, this is what science and ethics demands. It is our only moral option. While the demands of the Pledge are unshakeable commitments, there is much room for discussion and debate. Issues that have historically divided the environmental movement such as nuclear power, capitalism, reformism vs. radicalism—cannot divide and hobble us any longer. If we agree that a climate mobilization is necessary to save civilization, then we must work together towards that goal, as we discuss and debate how precisely the mobilization will unfold. The scale of the Pledge’s demands are commonly recognized as necessary among the leading lights of the environmental movement as well as prominent economists. A WWII mobilization has been advocated by Joe Romm, Paul Gilding and James K. Galbraith, among others. In 2011, a host of leading environmentalists signed an open letter to Barack Obama and Hu Jintao, calling for the United States and China to reduce their emissions 80% by 2020 through a “wartime-like mobilization.” Signatories included: Bill McKibben, Lester Brown, Ross Gelbspan, as well as the executive directors of the Sierra Club, Greenpeace, the Rainforest Action Network, and Friends of the Earth. But the Pledge’s demands, as well as its tone, have broad appeal far outside of the environmental movement. We have witnessed a wide variety of Americans react positively to the Pledge, including people who are politically disengaged, deeply religious, and politically conservative. This crossover appeal is necessary to achieve the kind of supermajority necessary to call forth a WWII-scale climate mobilization. We crafted the specifics of the Pledge in consultation with a network of allies, including scientists, leading activists, and citizens of conscience. Philip Sutton, the co-author of the highly acclaimed book, “Climate Code Red,” was particularly helpful in making sure that our demands were in line with the latest science and safety standards. We understand that this platform will be perceived as unrealistic in our current political climate of paralysis and despair. That’s why the Pledge to Mobilize is also a social movement strategy, designed to overcome our culture’s widespread denial and passivity and leverage massive public support for these scientifically necessary demands. The Pledge is a psychological tool that allows individuals, and our culture at large, to overcome the denial, dissociation, and passivity that keep most Americans from truly taking in the scope of the climate threat. The basic psychological premise is that the experience of helplessness is a key factor in denial and inaction. If we are to get hundreds of millions of people to grasp the horror of the threat, and to demand an emergency climate response, we need to truthfully tell individuals that 1) a comprehensive response exists, and 2) they are an essential part of that response. In order to get people to face the truth of the crisis, we need to empower them to participate in the solution. The Pledge strategy is not dependent on election cycles, because sitting politicians are also invited— and can be pressured— to sign. Mobilizers will call their Representatives to say, “I have supported you for 10 years with my vote, time, and money. But I recently signed the Pledge to Mobilize and I will no longer do so unless you sign it also.” However, elections are the most basic and forceful instrument of democracy. We must focus our strategy on the huge national election 2 years away. If we elect a Mobilization Government in 2016, then our next President will have eight years to lead the mobilization and bring the United States to carbon neutrality. This gives us two years to build a momentous social movement, to spread the Pledge far and wide, and to place relentless pressure on political candidates to step up. This will take a tremendous amount of effort, to be sure. Armed with the truth, the Pledge, and the spur of dire necessity, we can transform our culture and reclaim our democracy. The People’s Climate March is an amazing opportunity to launch this new strategy. Marchers who sign the Pledge will return to their communities and begin spreading it there. They will leave the march with a historic mandate to save civilization from climate change. The Pledge to Mobilize also creates a remarkable opportunity for the People’s Climate March. In not providing demands, the organizers of the PCM have allowed the marchers to speak for themselves — to make the march, and the actions that will follow it— their own. We offer the Pledge to Mobilize for this task. Some marchers have already told us that they want to sign the Pledge pre-march, and spread it to others during the march. Instead of seeing the lack of demands at the People’s Climate March as a fatal flaw, consigning the march to the dustbin of history before it has even occurred — we must view it as a golden opportunity. We, the marchers, can determine the demands of this march. By selecting clear, heroic, achievable demands for ourselves, and Pledging ourselves to them—we will invest both the Pledge and the People’s Climate March with tremendous significance and power. We will be begin offering the Pledge to Mobilize in the week preceding the March and throughout the march itself. 9/20 20 W 74th St, 5:30 presentation, 7:00 discussion and training. To make this happen, we need help! Let us rise to the challenge of our time, together. Sign up here to be part of our ground team, or attend a Climate Mobilization event, or take the Pledge at or preceding the PCM! *For a fast, visual explanation of this strategy: See the slideshow at the top of the homepage. This Article was written with Ezra Silk. Yale Poll: Millions of Americans Would Take a Climate Pledge! * 7% of Americans said that they would DEFINITELY sign such a pledge and 20% said that they PROBABLY would! Did these pollsters know about the Pledge to Mobilize, or did they come up with a very similar idea on their own? I guess brilliant minds think alike 🙂 Either way– there is no doubting the efficacy that Pledges have had on political campaigns throughout history– from the Pledge to end Chinese foot binding that ended a 1000 year old tradition in a generation, to the “Commitment Card” written by Martin Luther Kind JR, in which signers “hereby pledge myself—my person and body—to the nonviolent movement.” and agreed to ten stringent commandments on their behavior, to the “No tax Pledge” created by Grover Norquist which has effectively put a straitjacket on our political process. We hope that the Pledge to Mobilize, with its psychologically and technologically savvy features, will be the most effective pledge yet. And what great news to learn that millions of Americans are ready to sign! *Will you be in NYC for the People’s Climate March? We will be spreading the Pledge in a major way during that weekend. Get in touch and you can be part of our action team! *Are you a climate policy nerd (or an energy/ agriculture/ refugee/ medical policy nerd?) TCM cofounder Ezra Silk is starting a Mobilization Plans Working group. We have a great lineup of experts– both self taught and institutionally trained– and think the process of developing specific mobilization plans will be an exciting experience. Get in touch and tell us about your interest! Yes, after 5 years of hard work, I have completed my PhD program! I am currently winding down with my final patients, working with them for about 15 hours a week, but starting in August, I will be full time working on The Climate Mobilization. 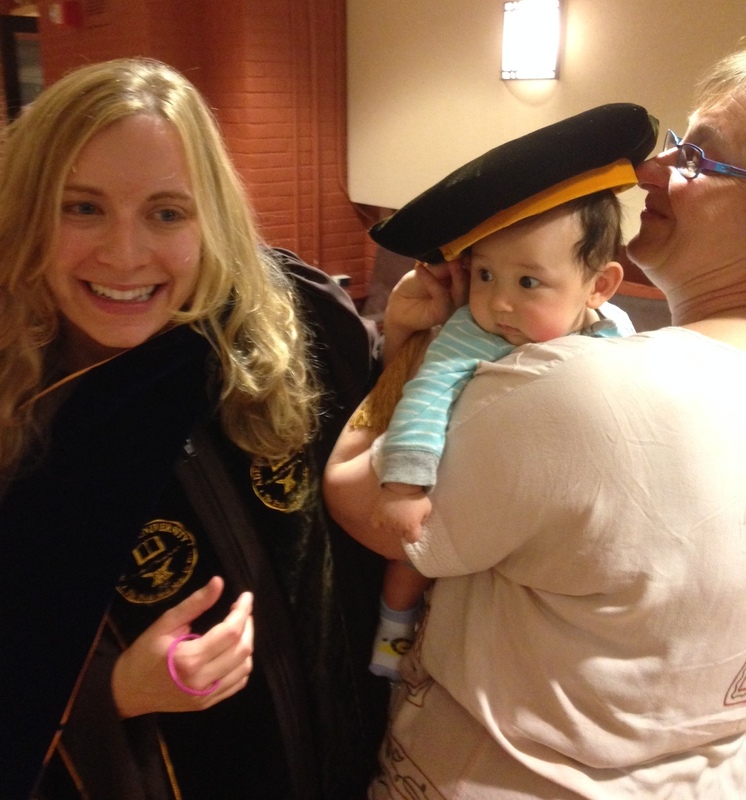 I am sad to be leaving the world of clinical psychology (for now, anyway) , but I am extremely pleased with the education I received and know that it contributes invaluably to my climate work. I have never felt as engaged with anything as I do with The Climate Mobilization.I feel it is what I was born to do, what I must do, and now– what I will do. All the time. Below is my favorite picture from the graduation ceremony, featuring me, my mom Angie, and my little nephew Josh. Allies-I have exciting news. The Climate Mobilization is very close to launch. Only one hurdle stands in our way from having TCM website built and beginning to spread the Pledge to Mobilize: we need to raise approximately $20,000 to pay for the design, programming, and other miscellaneous launch expenses. To accomplish this, we have begun an IndieGoGo campaign: Launch the Climate Mobilization. If you could consider contributing and spreading the word about The Climate Mobilization, and our fundraising campaign, that would be terrific. The campaign will only run until 7/22, so act now! We have also developed a slideshow, which provides an overview of The Climate Mobilization and the Pledge to Mobilize. You can watch the slideshow below, or view on full screen (It looks better on full screen!). So let me know what you think and thank you very much!